For every figure, for both sexes and also for an adolescent physique: VENO has the right tailor bust in its range in the truest sense of the word. 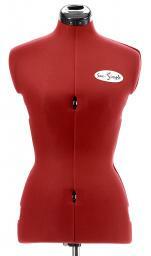 Sturdy, adjustable ladies tailor bust, high quality workmanship. For easy insertion and marking, this plastic bust has a high-quality, foam-reinforced nylon cover. The chest, waist and hip sizes can be adjusted independently of each other. The twelve adjustment wheels are easy and precise to operate. The tripod is height-adjustable, including the needle marker shown. 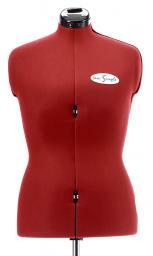 Sturdy, adjustable ladies tailor bust, high quality workmanship. For easy insertion and marking, this plastic bust has a high-quality, foam-reinforced nylon cover. The chest, waist and hip sizes can be adjusted independently of each other. The ten adjustment wheels are easy and precise to operate. The tripod is height-adjustable, including the needle marker shown. Sturdy, adjustable ladies' tailor bust, first-class workmanship. For easy insertion and marking, this plastic bust has a high-quality, foam-reinforced textile cover. Chest and hip circumference can be adjusted independently, the waist automatically adjusts proportionally. The eight adjustment wheels are easy and precise to operate. The tripod is height-adjustable, including the needle marker shown. Sturdy, adjustable children's tailor bust, high quality workmanship. Covered in premium nylon polyester felt for easy inserting and marking. Chest and hip circumference can be adjusted independently, the waist automatically adjusts proportionally. The twelve adjustment wheels are easy and precise to operate. The tripod is height-adjustable, including the needle marker shown. Sturdy, adjustable children's tailor bust, high quality workmanship. With cover of first-class nylon polyester felt for easy inserting and marking. Chest and hip circumference can be adjusted independently, the waist automatically adjusts proportionally. The twelve adjustment wheels are easy and precise to operate. The tripod is height-adjustable, including the needle marker shown. Very decorative and practical luxury bust with high-quality, foam-reinforced nylon cover for easy inserting and marking. The chest, waist and hip sizes can be adjusted independently of each other. Also the length of the back and the sizes of the neck. The twelve adjustment wheels are easy and precise to operate. Another eye-catcher is the turned real wood stand in the colour mahogany. Sturdy, adjustable ladies tailor bust with leg appendages. 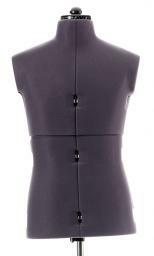 This great adjustable bust is also suitable for trousers due to the leg appendages. It is of high quality. The plastic bust has a foam-reinforced nylon cover for easy inserting and marking. The chest, waist and hip sizes can be adjusted independently of each other. The twelve adjustment wheels are easy and precise to operate. The tripod is height-adjustable, including the needle marker shown.